Over the past few months, I've picked up so many great Christian reads, like Steven Furtick's "(Un)Qualified: How God Uses Broken People To Do Big Things" and Dietrich Bonhoeffer's "Life Together: The Classic Exploration Of Christian Community". 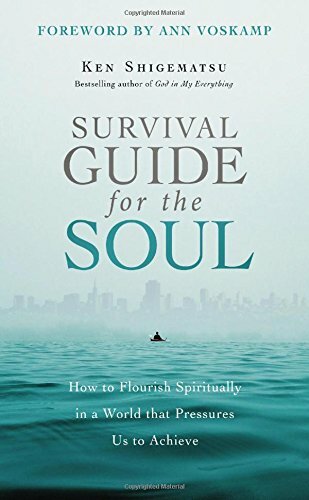 But it's the first time I've ever joined a launch team for a book, and I'm thrilled to share that I received an advance reading copy of Ken Shigematsu's "Survival Guide For The Soul" for the purposes of this review. The book was released Aug 7 and has already become a #1 bestseller on Amazon in the Christian Discipleship category (pretty cool eh). What keeps us from flourishing in our spiritual lives is a neglect of the inner life of the soul. And more and more today, this neglect is driven by our ambition to accomplish something big outside ourselves. We live in a society that pressures us to achieve professionally, socially, and through the constant acquisition of material possessions. As a member of Tenth Church in Vancouver, where Shigematsu serves as senior pastor, I appreciate the candour and self-deprecating humour in his sermons. This book has the same approach and tone, which I enjoyed. And contrary to what the title might suggest, this isn't a step-by-step guide to achieving your "best spiritual self" (thank heavens! ), but reads more like a personal and heartfelt sharing, with loads of practical suggestions peppered throughout. One of the key concepts in the book is the notion that we all have a Striving Adam and a Soulful Adam within us. The Striving Adam wants to be productive and successful, while the Soulful Adam wants real, authentic connection and meaning in life. Shigematsu goes on to talk about how these two opposing aspects of our inner selves can find harmony and balance through spiritual practices like meditation, keeping the Sabbath, practicing gratitude and having a servant heart. All of this resonated with me so much. For the past few years (pre-Vancouver at least), I've spent most of my waking hours working, to the point that everything else - my health, relationships and friendships - fell by the wayside. I knew my life wasn't well-balanced, and I was definitely not spiritually healthy or in a place of growth, but it was a vicious cycle that was really hard to get out of. My work was so closely tied to my identity that I felt like I couldn't not work for fear of falling behind and not being productive enough. Since taking a year-long sabbatical, I've learned to stop striving for external affirmation, and to stop depending on my own strength. I've learned that work is essential and necessary, but it shouldn't define who we are. I've also started to practice meditation through silent, contemplative prayer, like Shigematsu suggests, and it helps to make me feel less flustered and stressed when I think of what I need to do for the day ahead. As a freelance writer, I'm learning to trust that He will provide amidst the uncertainty. And when I get a new job, it isn't because of what I did, but because God is good. Period. This was pretty mind-blowing for me. I always thought spiritual practices had to be, well, super spiritual (images of a person kneeling in prayer for five hours daily come to mind). But Shigematsu argues that the things that make us come fully alive, whether it's being outdoors or being creative, are spiritual practices in and of themselves. I feel alive when I explore new places, go on a hike, or interview inspiring women of faith - and I aim to keep doing all of these. Through them, I hope to nurture my Soulful Adam more intentionally, and invest my time and energy in things that are life-giving and soul-enlarging. The other thing I liked about the book was that every chapter had a page featuring questions for reflection and discussion as well as a closing prayer - perfect for a life group study or devotions with your significant other! In short: If you feel overwhelmed and burned-out by the demands placed upon your life, and if you feel like you don't exactly have time to read a book at all - I think that's precisely why you should pick this up. Instead of letting life get away from you, why not figure out what life really should look like from an eternal perspective?